In the mid 80´s, the president Mrs Ingela Wieland of Landvetter FSC went to Canada to take a look at a fairly new kind of figure skating called Synchronized Skating. Until then it only existed in North America. 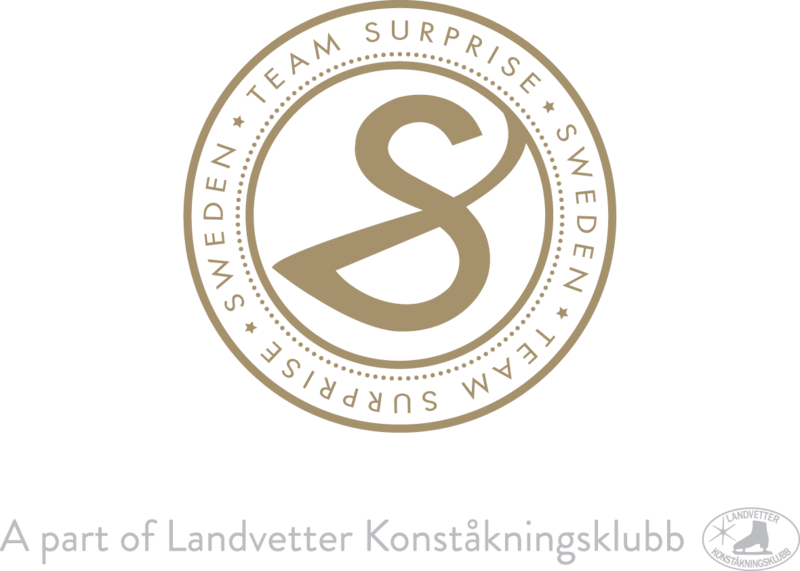 It was subsequently decided to hold the first national championships in Sweden in 1986. Only one team per region could attend, and in the west of Sweden there were two teams. One was a team from the city of Gothenburg and the other one was from Landvetter. The local federation decided that the city team would represent the region at the competition. Frustration ran high in Landvetter where it was felt that the best solution would be to let the teams compete for the position. However, the president of the club stepped in and made some research into the different possibilities she could think of. It turned out that there was a region in Sweden that did not have a team of their own and in a matter of a few days, all skaters on the team became members of Västerås FSC in the east of Sweden. When it was time to go to Montréal for the main competition, there was a notion that this might be yet another time when the name Team Surprise turned out to be a perfect fit. It is not commonplace to really take the breath out of a crowd, but when the team finished their routine and the music came to a halt, there were a few seconds of complete silence in the arena. Then there was a roar of applause while the whole crowd came to their feet for a standing ovation. To everyone´s great surprise, the team from Sweden walked away with the gold medal and synchronized skating took a great leap to a higher level than ever before. Something new – classical music, intricate footwork, speed, flawless transitions and deep edges were brought into this discipline of figure skating – and it was there to stay. This caught quite some attention in the world of figure skating. The “Swedish school” of Synchronized skating started to spread around the world and Mrs Dohany shared her ideas and excellent skating techniques at various seminars, geared towards both coaches and judges. Innovation, both in terms of style, choreography and specific elements, was sometimes frowned upon, but frequently became compulsory elements of Synchronized Skating. Team Surprise held a strong position competitively, but without a doubt, this team was the single most important source of evolution of Synchronized skating in general. The degree of difficulty increased at a rapid pace, yet Team Surprise were always in the forefront and managed to do that little bit extra to remain firmly in the lead. 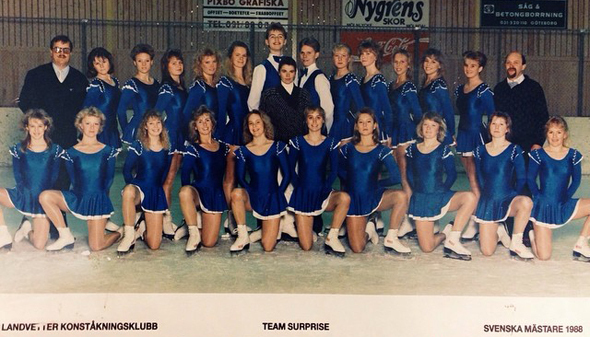 During the first few years of the 90´s, Team Surprise dominated Synchronized skating, and not once did they finish a competition with anything but a gold medal. Three World Challenge cup gold medals and five World Championship gold medals, along with countless gold medals from national and international competitions, was certainly proof of an exceptional level of quality. Following this, many more World Championship medals found their way to Mrs Dohany´s team. Perhaps the most cherished one came at the World Championships in Gothenburg 2005. It is truly special to cement such a success in your home arena, with the world watching in admiration at the sustainability of the success built by Mrs Dohany and her team. Team Surprise continue their mission of constant progress. Nothing is impossible, only the rules can stop us!